Did you know the battle between Monkey and Lord Erlang is tied to Han Dynasty funerary rights and folklore? Wu (1987) notes that, during the Eastern Han Dynasty (25-220 CE), the people of Sichuan often buried their dead in stone tombs decorated with brave heroes, such as archers and crossbowmen, and fierce animals, such as tigers and hounds. Regarding the latter, the canines are sometimes depicted attacking or intimidating apes, which were considered emblems of disease or bad luck (fig. 1). Therefore, by portraying the subjugation of such evil forces, the carvings are thought to have served the ritual function of protecting deceased loved ones from dark influences on their wayward journey to the afterlife (pp. 100-101). The idea of dogs overcoming apes should bring to mind Sun Wukong’s capture at the mouth of Lord Erlang’s loyal hound at the end of chapter six. One recurring motif depicts an archer drawing his bow to fall an ape in a tree (fig. 2). 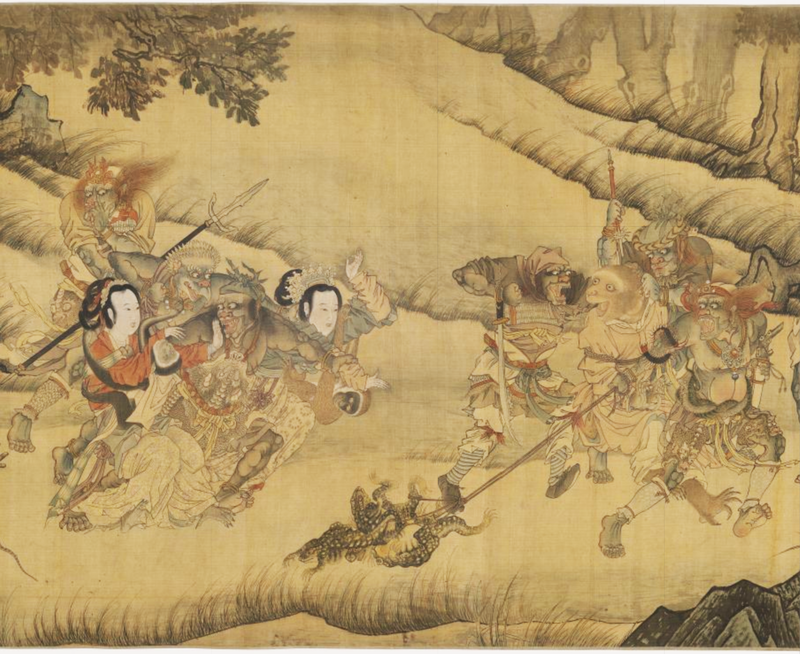 This is based on a third-century BCE tale about the legendary Chu archer Yang Youji (養由基) shooting an elusive white ape held in the palace of the King of Jing. This in turn is based on an even older tale about the archer Yi (羿) bringing order to the primordial earth by killing nine of ten suns that took the form of monstrous crows. Han era tombs are known to portray Yi drawing a bow to shoot said birds flying around a tree, so it most likely influenced the motif of Yang shooting the ape in a tree (Wu, 1987, pp. 102-106). Despite his later connection with the three-pointed polearm, Erlang was also portrayed as an archer in early media. Fig. 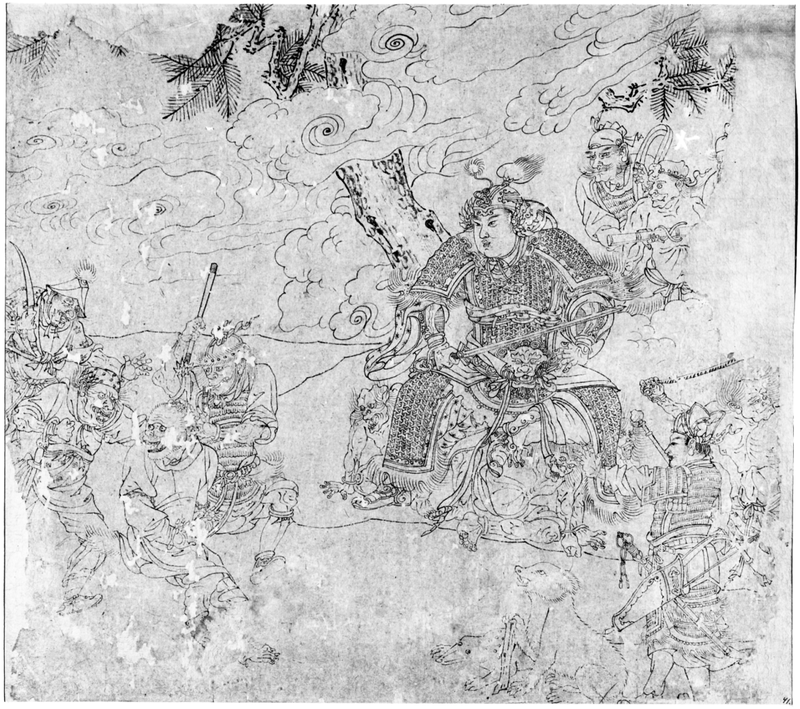 1 – (Top left) A Han Dynasty tomb rubbing of oversized dogs intimidating apes (larger version). Fig. 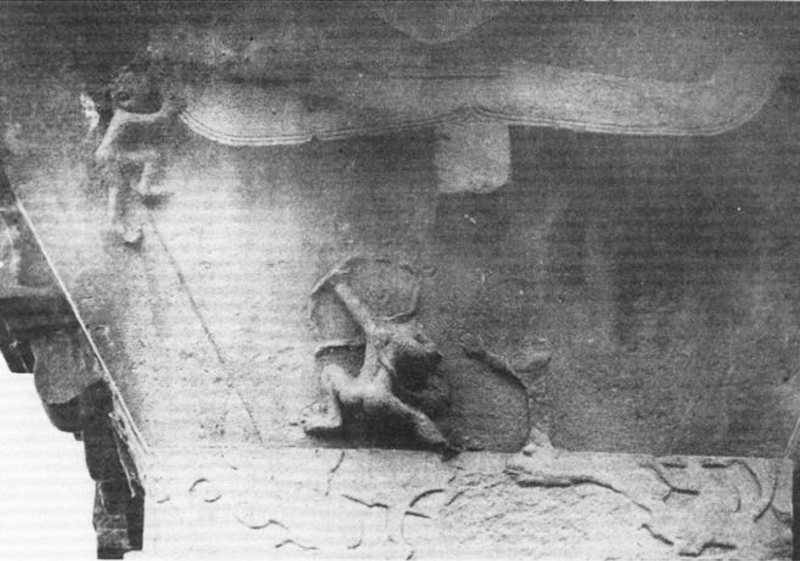 2 – (Bottom left) A Han tomb decoration depicting an archer shooting at an ape (larger version). Fig. 3 – (Center bottom) The 13th-century painting depicting Erlang and his soldiers rounding up and executing ape demons. A captive ape can be seen on the bottom left between the two soldiers (larger version). Fig. 4 (Center right) A detail from the 15th-century painting showing the ape, his humanoid wives, and their gibbon-like children being rounded up (larger version). This section is located in the last four-fifths of the scroll. Fig. 5 – (Right) A detail showing Erlang near the front of the same scroll (larger version). His armor differs slightly from that of the 13th-century version. Also take note of how a young page holds his bow, while a spirit soldier bears his (slightly obscured) three-pointed polearm. The Er-lang cult became even more popular in Sichuan under the patronage of the Later Shu emperor, Meng Chang 孟昶 (r. 934-65), and in 965, when the Song dynasty conquered the kingdom, it adopted the cult, erecting temples for the god in the capital and throughout the country. When the Er-lang cult became increasingly popular in Sichuan, the previous divine archers such as Yang Youji and Yi, (like many other legendary demon-quellers), were mologized into this new cult, and their defeat of an ape demon became an important part of the Er-lang legend. Er-lang’s traits in later stories and art works clearly disclose this transformation (pp. 107-108). It should also be noted that Erlang was at some point associated with the historical engineer Li Bing (李冰, c. 3rd-cent. BCE) and the official Zhao Yu (趙昱, c. 6th/7th-cent CE), both of whom were worshipped for defeating flood demons (Wu, 1987, p. 107). I suggest this may have led to his cult being connected to that of Yu the Great (大禹), the flood-queller par excellence in Chinese folklore. This is important because Tang Dynasty legends state Yu battled a simian water demon and eventually imprisoned it under a mountain (see Andersen, 2001). Sound familiar? This may have been another avenue in which Erlang was associated with quelling ape demons. One anonymous 13th-century album leaf ink painting portrays Erlang seated in a kingly fashion and watching as his spirit soldiers round up and execute ape demons (fig. 3). One anonymous 15th-century scroll painting reproduces the scene in color, along with other animal spirits (fig. 4 and 5). The image of the deity as a queller of ape monsters culminated in an anonymous Yuan-Ming Dynasty play called The God Er-lang Locks up the Ape-Demon “Great Sage-Equal to Heaven” (二郎神鎻齊天大聖, Er-lang Shen suo Qitian Dasheng). Much like JTTW, the god is sent to capture a magical primate, in this case an ape, who has stolen immortal food and wine from heaven. (Wu, 1987, pp. 108-109). This no doubt influenced Monkeys mischief in heaven and subsequent battle with the deity. Andersen, P. (2001). The demon chained under turtle mountain: The history and mythology of the Chinese river spirit Wuzhiqi. Berlin: G-und-H-Verl. Wu, H. (1987). 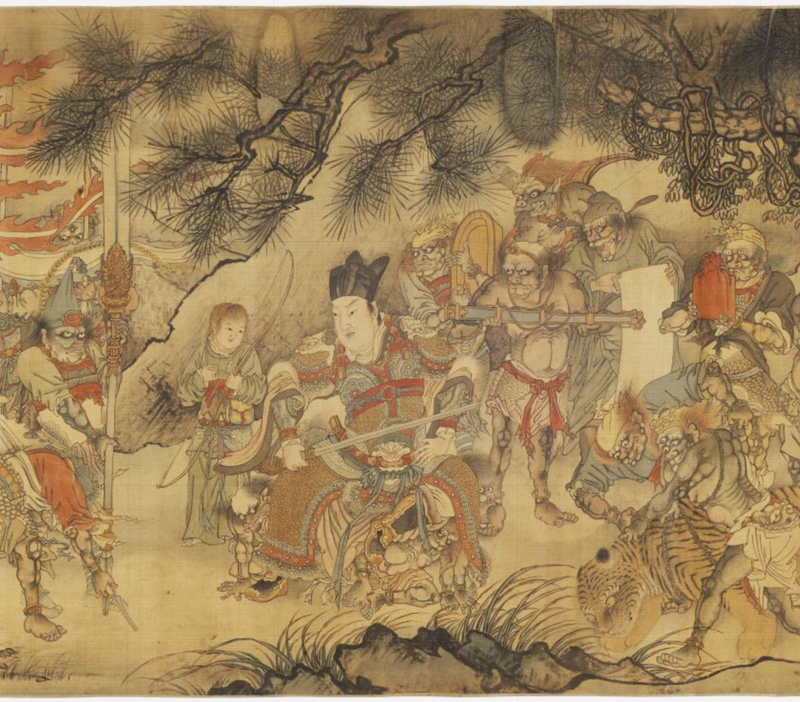 The earliest pictorial representations of ape tales: An interdisciplinary study of early Chinese narrative art and literature. T’oung Pao LXXIII, pp. 86-112.